From Frank Marrero's "Lincoln Beachey: The Man Who Owned the Sky"
Lincoln Beachey's amazing career is a piece of American history that most people probably do not know about -and may even find hard to believe. This story takes place at the turn of this century when the idealism of the age spawned a host of heroes: Alexander Graham Bell and Thomas Edison contributed monumental technological advances; Isadora Duncan recalled the dance of the ancients; Samuel Goldwyn and D.W. Griffith began to cast moving stories on the silver screen; Enrico Caruso thrilled millions from the operatic stage; Maria Montesorri breathed new life into children's education; Luther Burbank nurtured nature itself into new and vibrant forms; Henry Ford invented the assembly line and gave manufacturing innovative muscle. As these names flash across our memory, it is remarkable that one of their contemporaries, perhaps the most popular hero of his age, is now commonly unknown. Because he died just before America entered the first World War, his memorials and historical accolades, local and national, were eclipsed by heroes emerging from the war. He was lost amidst a new age. But while alive he was known by sight to hundreds of thousands and by name to the whole world. He performed for the largest audiences in the history of the United States. On his last tour of 126 cities in 1914 his average audience was said to be over 100,000. When the population of the U.S. was 76 million, 17 million people saw him in one 30-week period. He made more than the national average yearly income every day he performed. The United States Congress adjourned twice from formal sessions, in 1906 and 1914, to witness his performances. During his life he was compared to Milton and Michelangelo as well as to the leaders of his day. He was declared "the eighth wonder of the world" by a consortium of 100 newspapers. His fame was as vast as any in American history. His only fear was that he would be thought of as crazy and be forgotten. His only vices were "too many women" and an extreme boldness. His funeral in San Francisco was said to be the largest in the city's history. A national hero of colossal proportions has been unbelievably forgotten, and his iconoclastic story will re-write a bit of American history. Consider the accolades of the 'poet laureate of the people,' Elbert Hubbard: "Each art has its master worker-its Saint-Gaudens, its Paderewski, its Michelangelo, its Milton. There is music and most inspiring grace and prettiest poesy in flight by man in the heavens, and posterity will write the name of Lincoln Beachey as the greatest artist on the aeroplane. In his flying is the same delicacy of touch, the same inspirational finesse of movement, the same developed genius of Paderewski and Milton. The deftness of stroke of any of the old masters cannot exact his touch. He is truly wonderful." 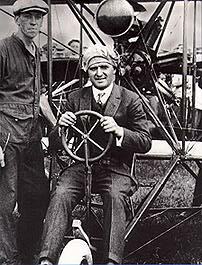 Lincoln Beachey was hailed with superlatives: "The Man Who Owns the Sky", "Alexander of the Air", "The Genius of Aviation", "Master Birdman", and "The Divine Flyer". He was universally declared "The World's Greatest Aviator" by everyone from Orville Wright to Glenn Curtiss, from poet Elbert Hubbard to inventors Thomas Edison and Alexander Graham Bell. He received the regard of Presidents from Teddy Roosevelt to Calvin Coolidge as his acclaim reached the very peak of American adoration. Beachey inspired thousands to invest their lives in aviation, including Charles Lindbergh, Eddie Rickenbacker, General Curtiss LeMay and five-star General Hap Arnold. He was personally and publicly credited with inspiring the reluctant U.S. government to build an air force. Beachey's records and achievements speak of his time and his stature: he was the first man to fly upside down; first in America to loop the loop and the first in the world to master that stunt; the first man to tail-slide on purpose; the first to figure out how to pull out of a spin; the first man to fly over Manhattan, Washington, Toronto, and scores of other American cities. He was the first to fly inside a building, the first to point his machine straight down and drop vertically until maximum velocity was reached, the first to pick a handkerchief from the ground with his wing tip. He even invaded the canyons of downtown Chicago, dressed as a woman, dancing 'her' biplane wheels across car tops and cobblestones. During the latter part of his career Lincoln Beachey earned enormous sums and planned to go into high-end design and aircraft development. But just after his twenty-eighth birthday, when he was being honored by a host of nations at the 1915 Panama-Pacific Exposition for his contributions to aviation, he drowned just inside the Golden Gate.